Discourse: Abstract at Anita Rogers Gallery, is an 11 person painting show; one work per artist. As with Sutures, each of the works has its own distinct style and presence. They run the gamut from small to large; some unabashedly dependent on color, while others employ a very limited palette. 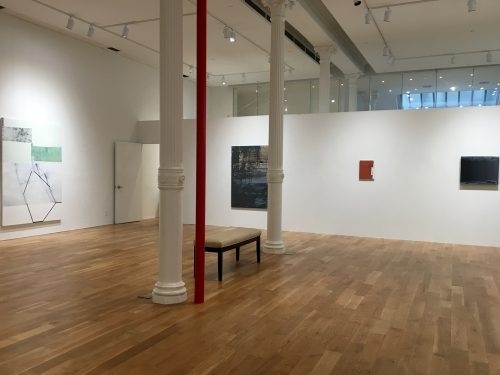 But where Sutures radiates energy and activity, Discourse is quiet and thoughtful; the atmosphere in the gallery is contemplative with each work demanding to be seen in its own time which the generous gallery space allows for. The coherence of the show comes from a shared command these artists display of both materials and process. One feels these works were chosen as much to create a discussion about the current state of abstraction as to provide a gateway into further exploration of each artist’s oeuvre. Much of the work presents a concern with formal considerations but the show does not ignore conceptual exploration, gestural passages and mixed media; Lael Marshall’s piece, for example, could have easily found a home in Sutures. At opposite ends of the exhibition (literally and figuratively) are works by Susan Smith and Mary McDonnell. Smith’s piece is one of the smallest and is composed of primary colors. It is seemingly straightforward, an initial impression that is challenged by an unexpected juxtaposition of media. What appears to be a simple formal construction of three squares becomes strangely visceral and moving in its elegant handling of materials. McDonnell on the other hand is represented by a large work is unruly and fairly bristling with color which seems to emerge in spite of its dark palette. It is also a profoundly gestural work that is barely contained by the canvas, as if she just managed to capture the presence of some unknown force. In between these pieces is Joan Waltemath’s painting where hard edge black forms lay atop a field of expressive and beautiful colors, reading perhaps as blips of data floating across our lives. This painting acts almost as a map of the exhibition; it has aspects of almost every work in the show containing as it does, an exploration of color, an authority of line, the power of “the edge”, an expressionist sense of abstraction and the layering of elements.